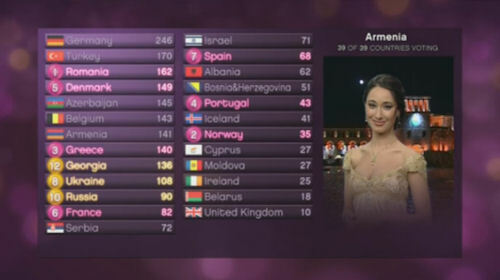 For all those people who are interested in the Eurovision Song Contest, here are the results for 2010. The venue for 2010 is the Telenor Arena in Olso, Norway. The semi final 1 was broadcast on Tuesday 25 May 2010, 2 hours long. The semi final 2 was broadcast on Thursday 27 May 2010, 2 hours long. The final was broadcast on Saturday 29 May 2010, 3 hours 20 minutes long. First Results appeared here at 23:40 UK on Saturday 29 May 2010. Belgium won the semi final 1, Greece finished in 2nd place, Iceland finished in 3rd place. Turkey won the semi finals 2, Azerbaijan finished in 2nd place, Georgia in 3rd place. For Background Details to the 2010 Eurovision Song Contest, please click here.